Wstęp. Analogi zasad purynowych są chemioterapeutykami stosowanymi w leczeniu nowotworów układu limfoproliferacyjnego. Znajomość ich wpływu na układ krążenia jest niewielka. Współczesne metody oceny układu sercowo-naczyniowego pozwalają na wiarygodną ocenę kardiotoksyczności powyższej grupy leków. Cel. Celem pracy jest przedstawienie wyników własnych badań dotyczących kardiotoksyczności analogów puryn. Materiał i metody. W Oddziale Hematologii i Transplantacji Szpiku obserwowano 8 pacjentów w wieku od 51 do 75 lat (mediana wieku – 63 lata), u których zastosowano chemioterapię z zastosowaniem analogów puryn. W tej grupie było 7 mężczyzn i 1 kobieta. Wskazaniami do chemioterapii były: przewlekła białaczka limfocytowa i białaczka włochatokomórkowa. Obserwacja objęła 3 cykle chemioterapii. Pacjenci poddani zostali badaniu fizykalnemu z oceną podstawowych parametrów dotyczących układu sercowo-naczyniowego (ciśnienie tętnicze, częstość akcji serca, oznaki niewydolności krążenia, tj. obrzęki kończyn dolnych, rzężenia nad polami płucnymi, powiększenie wątroby), elektrokardiograficznemu, echokardiograficznemu (oceniano funkcję skurczową i rozkurczową mięśnia lewej komory serca). Dodatkowo wykonano badania biochemiczne (troponina I i NT-proBNP). Ocena wszystkich badań została przeprowadzona przed rozpoczęciem leczenia chemioterapeutycznego i po 3 cyklach leczenia. Wyniki. Okres obserwacji obejmował 3 kursy leczenia chemioterapeutycznego (3-4 miesiące). W zakresie badania fizykalnego, elektrokardiograficznego, echokardiograficznego oraz oceny stężenia troponiny I u żadnego z pacjentów nie stwierdzono istotnych zmian mogących świadczyć o kardiotoksyczności analogów zasad purynowych. Wyniki powyższych badań przeprowadzonych przed rozpoczęciem leczenia oraz po chemioterapii nie różniły się w istotny sposób. U 63% pacjentów stwierdzono podwyższone stężenie NT-proBNP po leczeniu chemioterapeutycznym. Wnioski. Analogi zasad purynowych okazały się lekami bezpiecznymi pod względem wpływu na układ sercowo-naczyniowy w ocenie obejmującej kilkumiesięczny okres ich stosowania. Wyniki badań NT-proBNP wymagają dalszej oceny. Ze względu na szerokie wskazania do stosowania analogów puryn uzasadnione są dalsze badania na kardiotoksycznością tej grupy leków. Metody oceny wpływu analogów puryn na układ sercowo-naczyniowy są łatwo dostępne i mogą być stosowane we wszystkich ośrodkach stosujących leczenie chemioterapeutyczne. Introduction. Purine analogues are chemotherapeutics widely used in treatment of lymphoproliferative neoplasms. Knowledge of their influence on cardio-vascular system is small. Contemporary methods give us an opportunity of reliable assessment of cardio-vascular system. The aim of the study was presentation of the results of our research on cardiotoxicity of purine analogues. Material and methods. 8 patients were observed in the Department of Hematology and Bone Marrow Transplantation. Age of patients ranged from 51 to 75 (median – 63 years). There were 7 men and 1 woman. They were treated with purine analogues because of chronic lymphocytic leukemia and hairy cell leukemia. Observation lasted for 3 cycles of chemotherapy. We performed physical examination with assessment of basic parameters of cardio-vascular system (blood pressure, heart rate, symptoms of cardiac failure such as: peripheral edema, lung examination, liver enlargement), ECG, ECHO (with assessment of systolic and diastolic function of left ventricle). We also performed biochemical assessments (troponin I and NT-proBNP). All assessments were performed before we started the treatment and after 3 cycles of chemotherapy. Results. We observed patients for 3 cycles of chemotherapy (3-4 months). We didn’t found any symptoms suggesting cardiotoxicity of purine analogues in physical examination, ECG, ECHO or troponin I assessments. Results of our research before and after chemotherapy didn’t differ fundamentally. 63% of patient had elevated NT-proBNP level. Conclusions. Purine analogues turned out to be safe as far as cardiotoxicity is concerned during lasting few months observation. NT-proBNP results need farther research. Because of wide indications to use of purine analogues farther research should be carried on. Methods of assessment of cardio-vascular system are easily accessible and can be performed in all centers treating neoplasms. Słowa kluczowe: analogi zasad purynowych, kardiotoksyczność, nowotwory układu limfoproliferacyjnego. Key words: purine analogues, cardiotoxicity, lymphoproliferative neoplasms. Purine analogues (Fludarabine, Cladribine) are a group of chemotherapeutics widely used in treatment of patients suffering from neoplastic diseases of hemopoietic system, e.g. chronic lymphoproliferative neoplasms as single agents or in combined therapy (hairy cell leukemia, chronic lymphocytic leukemia) or as a part of treatment of acute leukemias (first line therapy in acute myeloid leukemias or second and further lines of therapy in resistant or recurrent acute lymphoblastic leukemias). Most common adverse events observed during treatment with purine analogues concern myelosupression (neutropenia, thrombocytopenia, anemia). Most common non-hematologic adverse events are: fever, dizziness, edema, fatigue, nausea, vomiting, diarrhea, gastritis, skin rush, peripheral neuropathy, vision disorders. Knowledge of their influence on cardio-vascular system is limited. The first data about cardiotoxicity of fludarabine were published by Spirano et al. (1). They used fludarabine in the treatment of chronic lymphocytic leukemia and observed symptoms of chronic heart failure in 8% of patients. In further publications cardiotoxicity of purine analogues is only mentioned (2, 3). However there are no complex studies of influence of purine analogues on heart muscle. Nowadays we have many methods giving us an opportunity of reliable assessment of cardio-vascular system. Physical examination, electrocardiography, biochemical examinations (troponin I, BNP, NT-proBNBP) and echocardiography are the examinations which enable us the assessment of cardio-vascular system (4-6). The aim of the study was to assess the influence of purine analogues on cardio-vascular system in patients with lymphoproliferative neoplasms. We obtained the permission of Bioethics Committee of Silesian Medical Academy (No. KNW/022/KB1/143/I/09). Our research was conducted as statutory study (No. KNW-1-128/09). 8 patients treated with purine analogues (7 men and 1 woman) were observed in the Department of Hematology and Bone Marrow Transplantation in Katowice between 05.2010 and 02.2012. Age of patients ranged from 51 to 75 years (median – 63 years). All of them signed ICF (Informed Consent Form) before entering the study. The reason of chemotherapy was chronic lymphocytic leukemia (6 patients) or hairy cell leukemia (2 patients). Observation lasted for 3 cycles of chemotherapy which stands for 3-4 months. Most of patients had concomitant diseases – hypertension (5 patients), chronic coronary heart disease (2 patients), diabetes type 2 (1 patient). 1 patient had the history of myocardial infarction. Most of them had more than one concomitant disease. Table below shows characteristics of examined group (tab. 1). Table 1. Characteristic of examined group. M.S. 65 M FC 04.2010 CLL ? A.L. 65 M FC 05.2011 CLL ? F.W. 70 M ClC 03.2010 CLL ? F – fludarabine; Cl – cladribine; C – cyclophosphamide; R – rituximab, CLL – chronic lymphocytic leukemia; HCL – hairy cell leukemia; ChCHD – chronic coronary heart disease; MI – myocardial infarction; HT – hypertension; DI – diabetes. We performed physical examination with assessment of basic parameters of cardio-vascular system (blood pressure; heart rate; symptoms of cardiac failure such as: peripheral edema, lung examination, liver enlargement) and electrocardiographic evaluation in all patients. The basic method of assessment of cardiac function was done by transthoracic echocardiography (probe 2.5 MHz probe of Acuson Antares), which is the preferred method for the documentation of cardiac dysfunction at rest. This method is rapid, safe and widely available. It is a non-invasive technique that allows the assessment of chamber dimensions, wall thickness and geometry, indices of regional and global, systolic and diastolic ventricular function. It also provides the assessment of valvular function. In this study the examination comprised mono- and two-dimensional echocardiography, conventional and colour Doppler flow imaging (pulsed- and continuous wave Doppler) and tissue Doppler echocardiography. All of the cavities dimensions and wall thickness were assessed. We also assessed the systolic and diastolic function of left ventricle (LV). The ejection fraction of LV was measured using the apical biplane Simpson’s method. The systolic function was also assessed by evaluation of regional contractility disturbances. The evaluation of the diastolic function of LV was performed according to the European Society of Cardiology Working Group on Myocardial Function. The two hallmarks of left ventricular diastolic dysfunction are impaired relaxation and decreased diastolic compliance. The following measurements were done to assess the diastolic function of LV: mitral inflow and pulmonary vein flow, together with tissue Doppler imaging (TDI) of mitral annulus velocity. The following parameters were evaluated: E/A – ratio of early (E) and atrial (A) mitral peak flow velocity, dtE – early mitral flow deceleration time, S/D – ratio of pulmonary venous systolic (S) and diastolic (D) peak flow, Ar – peak reverse flow velocity at atrial contraction, Ar-A – difference between pulmonary venous and mitral A wave duration. Schemes of parameters used for echocardiographic evaluations are shown on figures 1 and 2. The classification of Canadian Cardiovascular Society and European Society of Cardiology criteria were applied for evaluation of measured parameters (tab. 2, 3). Fig. 1. The three filling patterns: impaired relaxation, pseudonormalized filling and restrictive filling represent mild, moderate and severe diastolic dysfunction, respectively. Fig. 2. 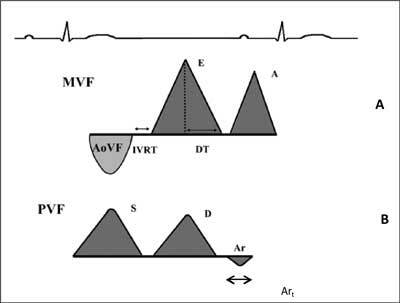 A – Schema of mitral valve flow and the way of measurement of isovolumic relaxation time (IVRT) and deceleration time (DT). 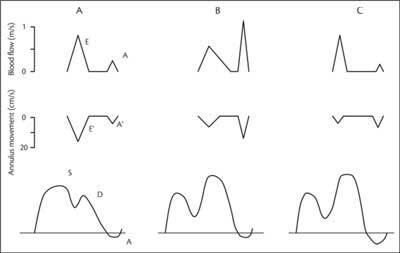 B – Schema of pulmonary vein flow and the way of measurement of systolic (S) and disatolic (D) peak flow, peak reverse flow velocity at atrial contraction (Ar) and mitral A wave duration time (Art). Table 2. Diagnostic criteria for diastolic heart failure according to European Society of Cardiology. E/A – ratio of early (E) and atrial (A) mitral peak flow velocity, dtE – early mitral flow deceleration time, S/D – ratio of pulmonary venous systolic (S) and diastolic (D) peak flow, Ar – peak reverse flow velocity at atrial contraction, Ar-A – difference between pulmonary venous And mitral A wave duration, isovolumic relaxation time (IVRT). Table 3. Canadian Cardiovascular Society diastolic dysfunction classification. We performed biochemical assessments – Troponin I (cTnI) and NT part of brain natriuretic peptide (NT-proBNP) in all patients. Laboratory assessments were performed in blood plasma. 15 ml of venous blood was collected each time we did biochemical evaluations. Assessments of physical examination, electrocardiography, laboratory tests and echocardiography were performed twice: before start of treatment and after 3 cycles of chemotherapy. Physical examination. Physical examination carried out before treatment showed normal blood pressure and heart rate in all patients. None of them had any symptoms of heart failure (there were no legs edema, lung rales or liver enlargements). There were no significant differences in physical examination performed after 3 cycles of chemotherapy in all patients. Electrocardiography. Electrocardiograms of all patients, performed at the beginning and in the end of observation, did not differ significantly. There were no recent heart ischemia or important conductibility or heart rhythm disturbances. Echocardiography. Echocardiography provided information about both systolic and diastolic function of left ventricle of heart muscle. 5 of 8 patients had no deviations of systolic and diastolic function of left ventricle in both examinations performed before and after 3 courses of chemotherapy with use of purine analogues. 2 patients had impaired diastolic function of left ventricle in echocardiography performed before start of treatment and there were no significant changes in tests after 3 courses of chemotherapy. 1 patient (with concomitant diseases – chronic coronary heart disease, myocardial infarction in the past and hypertension) had impaired both systolic and diastolic function of left ventricle in examination performed before start of chemotherapy. They were stable during treatment. Table 4 shows results of echocardiography evaluations. Table 4. Results of echocardiography. 0.14 Ejection fraction (EF) 35%. Biochemical and hormonal tests. Biochemical evaluations were performed before start of chemotherapy and after 3 courses of treatment. We evaluated plasma level of troponin I of all patients. They were within normal range in evaluations performed in both time points of the study. Evaluations of level of NT-proBNP were more complicated. 3 patient had normal levels of NT-proBNP in all evaluations. Another 3 patients had normal levels of NT-proBNP before beginning of chemotherapy and elevated levels after 3 courses of treatment. 2 patients had elevated levels of NT-proBNP in both evaluations (increase over upper normal limit in probes taken before treatment was 1,3x and 2,2x, in probes taken after chemotherapy – 1,6x and 3,2x). Among patients with elevated NT-proBNP after chemotherapy increase of NT-proBNP ranged from 1,6x to 3,7x (median – 3,2x). Elevated levels of NT-proBNP were found in both groups of patients- with and without concomitant diseases of cardiovascular system (chronic coronary heart disease, hypertension). Because of limited number of patients in the study group and short time of observation it is difficult to make any general conclusions. Nevertheless elevation of this parameter, as important as physical examination, ECG or ECHO in diagnostics of chronic heart failure (7), in most of our patients might suggest cardiotoxic influence of purine analogues on heart muscle. These results are very promising but reliable estimation of its importance needs longer period of observation of a bigger group of patients. Table 5 shows results of biochemical evaluations. Table 5. Results of biochemical evaluations. Chemotherapy in neoplastic diseases of hemopoietic system treatment, including lymphoproliferative neoplasms is associated with different adverse events. The risk of adverse events occurrence depends on the type of medicine, its dose, frequency of administration, co-morbidities, personal sensitivity. The risk of symptomatic heart impairment is estimated at about 20% (8). The drug toxicity on the cardiovascular system may occur at any time of cytostatic treatment. One of the publications described acute cardiotoxicity which occurred soon after administration of the drug. Transient heart rate disturbances (9-11), pericardial effusion (8), occasionally acute left ventricle failure (9, 12) were usually observed. The other kind is subacute cardiotoxicity which can occur after admission of the last dose of medicine or in 30 months period after the treatment completion. The symptoms inlcude slowly progressing left ventricle failure and subsequently right ventricle insufficiency (8, 13). At last cardiotoxicity may occur as chronic (late), it appears one year or a few years after admission of the treatment. The symptoms are: heart ventricles impairment or chronic heart rate disturbances (8, 9). Out of all chemotherapeutics the best known group of medicines with documented cardiotoxicity are antracyclin antibiotics. There is also vast evidence on harmful influence on heart muscle of other drugs including alkylating agents i.e. : cyclophosphamide, ifosfamide, cisplatin as well as vinca alkaloids (vincristine, vinblastine, vinorelbine), bleomycin or fluorouracil (8-16). Purine analogues are used in many neoplastic diseases of hemopoietic system. Mostly as combined therapy with other drugs of potential cardiotoxic influence on heart muscle (cyclopfosphamide or antracyclin antibiotics). Most of the indications for treatment with purine analogues are low grade lymphomas i.e. : chronic lymphocytic lymphoma, hairy cell leukemia, mantle cell lymphoma. These diseases usually appear in elderly patients with many co-morbidities. Most of co-morbidities are diseases of cardiovascular system. Among our patients more than 60% suffered from cardiovascular diseases. There is increasing amount of data that purine analogues are potentially cardiotoxic (1-3). Knowledge about its influence on cardiovascular system is very important, especially when we realize that we use them with other cardiotoxic agents to treat patients with cardiovascular co-morbidities. Nowadays we have many reliable methods of assessment of cardio-vascular system including physical examination, biochemical tests (most important are troponin I – sensitive marker of heart muscle necrosis; BNP and NT-proBNBP – agents of high negative predictive value for diagnosis of heart failure), electrocardiography, Holter ECG, echocardiography (with assessment of heart muscle morphology, its systolic and diastolic function), radioisotope methods such as radionuclide angiography or perfusion scintigraphy and heart muscle biopsy- sensitive method of heart muscle damage assessment. Physical examination, ECG, echocardiography and biochemical tests appear to be most important and widely available in the assessment of cardiovascular system (4-8). Biochemical evaluations of BNP and NT-proBNP seem to be very interesting as far as assessment of cardiovascular system of patients undergoing chemotherapy is concerned. They have been used as markers in diagnostics, risk assessment and monitoring of treatment of heart failure and risk assessment in acute coronary syndromes so far (6,17,18). Our investigations seem to show that BNP or NT-proBNP might help us extract group of patients of higher risk of cardiotoxic influence of not only purine analogues but also other drugs used in treatment of hematologic neoplasms. They also might help us monitor cardiotoxicity of that treatment. We believe that further studies on that problem, including bigger group of patients in longer period of time, should be continued. 1. In our evaluations purine analogues turned out to be safe as far as cardiotoxicity is concerned. NT-proBNP results and its importance require longer evaluations in larger group of patients. 2. None of the patients stopped chemotherapy because of cardiotoxicity of purine analogues. 3. Because of broad indications for use of purine analogues evaluation of its cardiotoxicity should be continued. 4. Methods of cardiotoxicity assessment of purine analogues are easily accessible and can be performed in all sites treating patients with chemotherapy. 1. Stelitano C, Morabito F, Kropp MG et al. : Fludarabine treatment In B-cell chronic lymphocytic leukemia: response, toxicity and survival analysis in 47 cases. Haematologica 1999; 84: 317-323. 2. Spirano M, Clavio M, Carrara P et al. : Fludarabine in untreated and previously treated B-CLL patients: a report on efficacy and toxicity. Haematologica 1994; 79 (3): 218-24. 3. Robak T, Błoński JZ, Góra-Tybor J et al. : Cladribine alone and In combination with cyclophosphamide or cyclophosphamide plus mitoxantrone In treatment of progressive chronic lymphocytic leukemia: report of a prospective, multicenter, randomized trial of the Polish Adult Leukemia Group (PALG CLL2). Blood 2006; 108: 473-479. 4. Kapusta L, Thijssen JM, Groot-loonen J et al. : Discriminative ability of conventional echocardiography and tissue Doppler imaging techniques for the detection of subclinical cardiotoxic effects of treatment with anthracyclines. Ultrasound in Medicine & Biology 2001; 27 (12), 1605-1614. 5. Galderisi M, Francesco Marra F, Esposito R et al. : Cancer therapy and cardiotoxicity: The need of serial Doppler echocardiography. Cardiovascular Ultrasound 2007 5:4. 6. Marchel M, Filipiak KJ: Współczesna diagnostyka biochemiczna niewydolności serca- w poszukiwaniu nowych markerów. Polski Przegląd Kardologiczny 2003; 5, 4, 397-407. 7. Wytyczne 2008 Europejskiego Towarzystwa Kardiologicznego dotyczące rozpoznawania i leczenia ostrej oraz przewlekłej niewydolności serca. Kardiol Pol 2008; 66(Supl.4), 389. 8. Kaczmarek-Borowska B, Ładna E, Wójcik J: Kardiotoksyczność antracyklin i innych leków przeciwnowotworowych. Diagnostyka i zapobieganie. Onkologia Polska 2002; 5, 3-4: 167-177. 9. Shan K, Lincoff M, Young J: Anthracycline-Induced Cardiotoxicity. Annales of Internal Medicine 1996; 125: 47-58. 10. Steinberg JS, Cohen AJ, Wasserman AG et al. : Acute arrhythmogenicity of doxorubicin administration. Cancer 1987; 60: 1213-8. 11. Lenaz L, Page JA: Cardiotoxicity of adriamycin and related anthracyclines. Cancer Treat Rev 1976; 3: 111 -20. 12. Ferrans VJ: Overview of cardiac pathology in relation to anthracycline cardiotoxicity. Cancer Treat Rep 1978; 62: 955-61. 13. Wojtukiewicz M, Omyłka J, Kozłowski L et al. : Kardiotoksyczność antracyklin. Post Hig Med Dośw 2000; 54: 467-485. 14. Goldberg MA, Antin JH, Guinan EC, Rappeport JM: Cyclophosphamide cardiotoxicity: an analysis of dosing as a risk factor. Blood1986; 68, 5: 1114-1118. 15. Sławomir Badurek: Odległe powikłania kardiologiczne terapii onkologicznej. Kardiologia Polska 2004; 61: 296. 16. Wojtacki J: Powikłania kardiologiczne chemioterapii przeciwnowotworowej. Pol Arch Med Wewn 1998; 100:470-481. 17. Morrow DA, de Lemos JA, Sabatine MS et al. : Evaluation of B-type natriuretic peptide for risk assessment in unstable angina/non ST-elevation myocardial infarction: B-type natriuretic peptide and prognosis in TACTICS-TIMI 18. J Am Coll Cardiol 2003; 41:1264-72. 18. Windhausen F, Hirsch A, Sanders GT et al. : N-terminal pro-brain natriuretic peptide for additional risk stratification in patients with non-ST-elevation acute coronary syndrome and an elevated troponin T: an Invasive versus Conservative Treatment in Unstable coronary Syndromes (ICTUS) substudy. Am Heart J 2007; 153: 485-92.